One electronically tested 14KT white gold ladies cast & assembled opal and diamond ring with a bright polish finish. The ring features an opal set within a diamond frame, supported by split shoulders and a ribbed under gallery, completed by a two millimeter wide band. Identified with markings of "14K". Condition is new. One orange crystal that is cut in a rectangular cus shaped cabochon and is prong set, measuring 14.00 mm long x 10.50 mm wide, and 5.85 mm thick and the approximate weight is 5.36 carats. 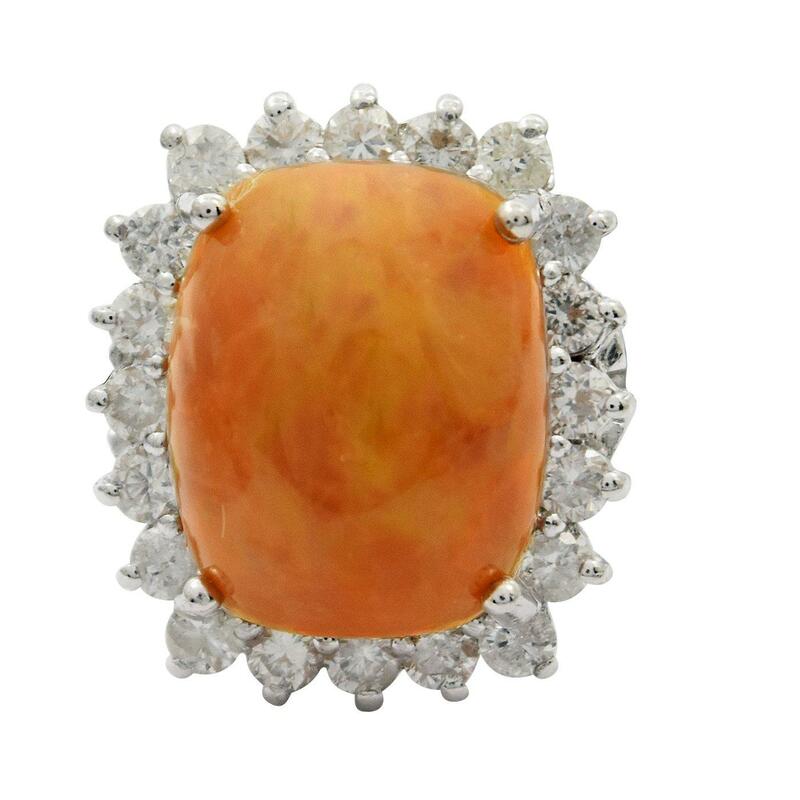 The opal has a somewhat bright, green-orange play of color (fire) in a flashfire pattern; a medium dome; a good cut; slightly included; major dull spot in its brightness and pattern; and is somewhat directional. Transmitting light somewhat diffusely, transparent to translucent. Naturally occurring internal & external characteristics are present. Graded in the setting. Twenty prong set round brilliant cut diamonds approximate total weight of 20 Stones = 0.81ct. Graded in the setting.